It’s no secret that keen environmentalists love talking about composting. Here’s five reasons why it’s a key factor for sustainability and features prominently in green debates. 1. Composting reduces landfill waste and incineration, and therefore emissions. Modern waste management methods are environmental tragedies. Waste lies stagnant in landfill sites where the vital oxygen that is needed to facilitate the decaying process cannot reach it. Landfill material also releases greenhouse gases that contribute to climate change: methane gas escapes during the building process. Incineration leaves some toxic ash waste, and the burning process releases a vast amount of carbon dioxide into our precious atmosphere. 2. Composting reduces dependence on fossil fuels. Most people buy compost for their own potting needs, however in the words of expert composter John Cossham, ‘Home compost is always superior.’ Commercial methods of composting require the use of oil-reliant machinery and a sped-up method of oxidising organic matter at a high heat to get it to break down quickly. No fungal decomposition is involved in this process. Through the slower and more traditional method of composting at home, there is more assurance that everything has been well-broken down by the fungi and bacteria. 3. Composting is good for the land. Everything you compost at home becomes a thriving habitat and nutritious fodder for an entire population of bacteria, bugs, worms, fungi and creepy crawlies, and what they leave behind becomes nourishing fodder for you plants. The amount of methane emitted through a well-managed compost heap at home? ZERO. Composting is nature’s way of recycling, found in ancient woodlands and other natural soils across the world. It uses a natural process that still occurs worldwide to produce rich degraded organic matter, also known as humus. This humus provides channels for air and moisture to get into the soil and other gases to get out, eg respiration gases from fungi and insects. Soils with organic matter in them allow mycorrhiza fungi to form a network between different plants in order to facilitate nutrient exchange, and perhaps even communicationexchange — but that’s another topic altogether. 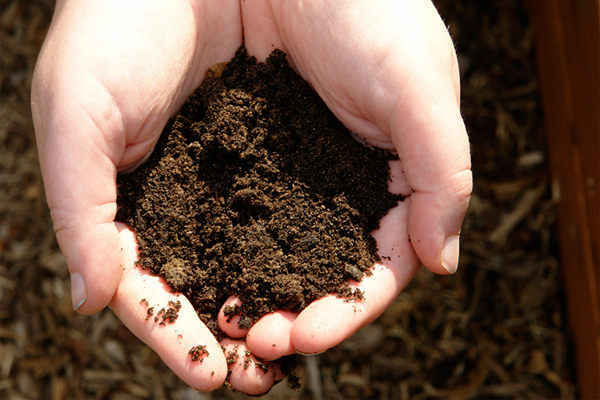 Composting is the active breakdown of foods and other materials through an organic process. The ‘waste’ matter becomes as rich as the nutrients you put into it, and compost made from a variety of ‘waste’ materials usually harbours vital micronutrients. You can test this theory by conducting the following experiment. Pot one plant into garden soil and another plant into garden soil mixed with compost. The outcome? The plant in the partial-compost will grow visibly larger than the purely soil-based one. 4. Composting Helps You to Embrace the Natural Cycle of Life and Decay. Environmentalism is at times heavily focused on the idea of ‘waste,’ because it is such a key issue to the health of the planet. However, ‘waste’ is a human concept and also a humanproblem. In nature there is no waste, as every living thing serves a greater purpose than its own lifespan, and contributes to the growth of something else. It’s easy to forget this crucial fact, but when you delve into composting your own ‘waste’ you learn to appreciate the cycle of life which involves decay and new growth in equal measure, and you come to understand that everything has a place in the world. San Francisco is a city that aims for its citizens to live within their means when it comes to ‘waste’ production. In addition to its high recycling rates, the city can also fine citizens found guilty of throwing food in the rubbish bin. This ordinance was introduced with the understanding that landfill-bound waste could be reduced by up to thirty per cent through instigating composting. However, this figure is dependent on the wide-spread idea – and myth – that many types of waste, including certain types of food, cannot be composted, which is simply not true. In fact, you can compost anything that has lived or grown recently. You can compost anything that hadn’t fossilised, as well as types of latex rubber such as marigold gloves, hot water bottles, and latex condoms. There is endless and conflicting advice regarding which materials should not be composted, but evidence behind the suggested reasons is only theory-based, unclear, or murky at best. Cooked foods are said to attract rats, however this can be avoided by digging the compost bin into the ground, ensuring that it has a well-fitted lid, and- if rats really are a problem- burying food waste under a thin layer of the compost that is already in the bin. Many items of decaying food apparently smell bad when they decay, however this can also be remedied, as compost that smells requires more dry materials, e.g. paper, card or twigs. Composting requires very little work and resources and it has a huge positive impact on the environment. It creates excellent new resources, and in my experience it can encourage even the most stubborn anti-green individual to take part in making a difference. And that’s why it’s the greenest thing you can do for our planet. This entry was posted in Garden Inspirations, Gardening and tagged compost bin, compost heap, composting, gardening, organic matter, waste management methods. Bookmark the permalink.